Israeli soldiers shot, Saturday, a young Palestinian man at the Container Military roadblock, north of Bethlehem, in the occupied West bank. The soldiers shot the young man with a live round in his leg and prevented Palestinian medics from even approaching them. 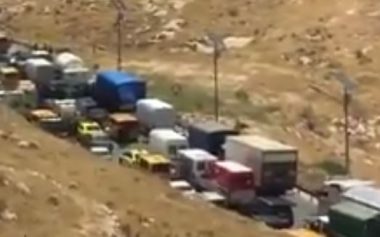 His identity, and the reason for shooting him, remain unknown, especially since the soldiers closed the overcrowded military roadblock, causing a huge traffic jam. The Israeli army only said that the man, 40, reportedly stepped out of a car, and started walking towards the soldiers, before they shot him.